Bac Son is a rural district of Lạng Sơn Province in the Northeast region of Vietnam and it is situated 160km northeast of Hanoi. One of the interesting aspects about this valley is its incredibly high mountains which are about 500-1200 meters high. These mountains, together with the valley’s paddy fields, create a great scenic landscape that you can only see its best after climbing to the peak of a mountain which is located just a few minutes from the town. The valley’s pathways leads you to the paddy fields where you’ll get a chance to see the beautiful river that runs crossing the rice fields. Besides the valley itself, Bac Son district’s villages possess a beauty of their own. The district is inhabited by the Tay ethnic people and their traditional stilt houses. Some of overnight tours will be the best for both the beautiful scenery and learning the local life of the hill tribe. 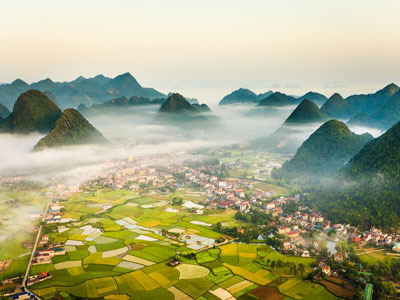 The early settlers of the Bac Son Valley initially resided in Lang Son province, in north Vietnam. When Lang Son was explored in 1922, 43 sites were found related to the ancient Bac Son culture prevalent in the mountains. Bac Son Valley’s fertile soil lets the local farmers grow various crops in the area. Its main crop is rice which is planted only in two seasons, with each of its squared field cultivated and harvested in different times. Apart from rice, other crops like sweet potatoes and corn also grow in this valley, giving a boost to the agriculture of the region by 80 percent. This is the reason that agriculture is the prime occupation and source of earning for inhabitants. This valley has just become a source of interest for tourists because of its enticing beauty. However, it is still known as an off-the-beaten-track destination for oversea travelers. The easiest way to reach this valley is by taking a road trip from Hanoi using Highway 3 to Thai Nguyen and turning to National Highway 1B. There are still a few tour operators organize tours to the area but Custom Vietnam Travel is one of the pioneer travel company covers this service. With the list of different interesting tours in this website, you will have number of different choices to custom-make your Vietnam holiday. Make sure that you visit this enchanting valley of beauty. Seeing such a beautiful place will make you realize that Mother Nature has so much to offer. Moreover, there is so much to explore in the valley and its surroundings. Some of the interesting activities includes climbing to the summit of telephone-station Mountain for the panorama view; walking or bicycling around to visit the villages of stilt houses witness the local rustics working on their rice and vegetable fields. Hiking on a back road to enjoy the peaceful land. No more hesitation, get your bag and go! From April to November, The rice carpets the valley and landscape becomes so green and beautiful, it looks really stunning from a mountain's summit. There are two crops of rice during these months. 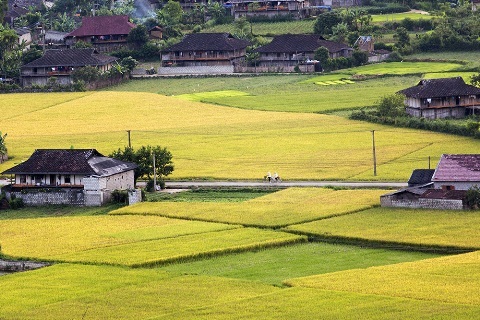 This is why the valley is known as the green paradise, except for July and November as these are the times when the rice getting ripe and the color is turning yellow, ready for the harvests. July and November are the favorite months for photographers to come and hunt for beautiful pictures. October and November are voted to be the best time to come for both weather and scenery.